The K League Classic action continues following the International Break on Sunday afternoon, whilst the K League Challenge contains following mid-week FA Cup Matches. 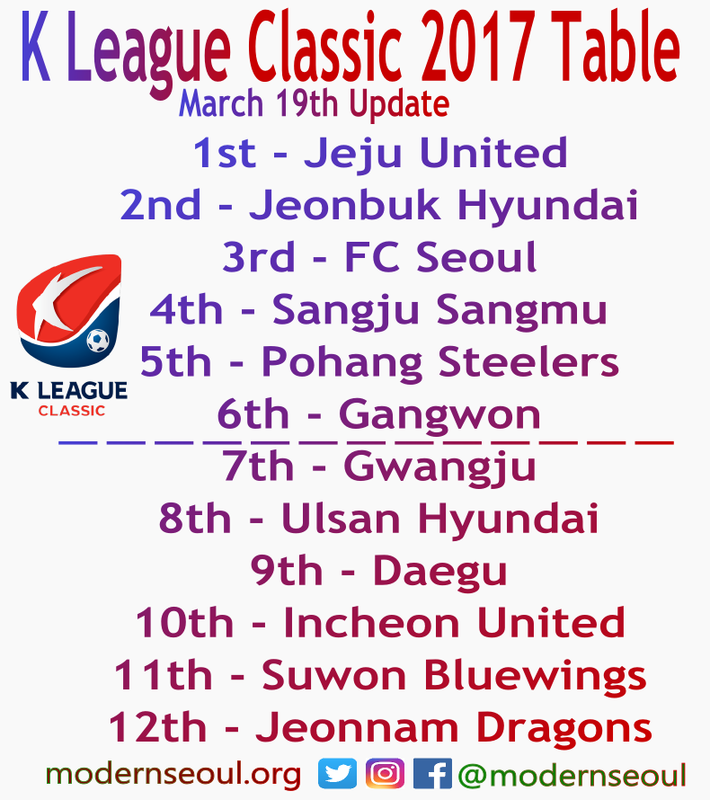 It’s been a slightly slow but interesting start to the 2017 season, with Jeju United being the standout side so far. Jeju play on Sunday against Gwangju. Our highlight game of the day comes from the Jeonju Civil Stadium (The temporary home of Jeonbuk Hyundai). It’s a rematch between last seasons big two Jeonbuk and Seoul. Jeonbuk won the champions league knocking Seoul out along the way, but finished second to Seoul in the league. Jeonbuk are undefeated so far this season, but dropped points 2 weeks ago drawing v Incheon United. FC Seoul are also on seven points, but were gifted (due to a now suspended ref) a win a couple of weeks ago. Last Time: Seoul won 1-0 in the final game of the 2016 season. On paper Jeonbuk at home should have the edge and the civil stadium hasn’t been a nice place to visit so far. The second 3 o’clock kick off comes from the Munsu Cup Stadium, where Ulsan host Gangwon. Ulsan won their opening game of the K League season but have looked poor since then, losing twice. With the probable issue being them balancing the ACL and K League. Gangwon have only done a little better, beating Sangju but drawing with Pohang and also losing against Seoul. Last Time: Ulsan won 2-1 back in 2013. At home Ulsan should have the edge, however Gangwon have a solid squad and could put up a good fight. The finally 3 o’clock kick off on Saturday comes from the Jeju World Cup Stadium. Jeju United are the in-form K League side so far this season, and have even produced solid results on the road during the ACL. They have won all 3 of their league games without conceding a goal and are currently the leagues most dangerous attacking side. Gwangju won the opening weekend but have lost twice since then, but they were unlucky vs. FC Seoul. Last Time: Gwangju won 2-1 last August. Jeju here unsurprising favorites to win, and it would be a shock if they didn’t. Jeonbuk claim a narrow but important win over FC Seoul, Kim Jin-Su with the winning goal. Ulsan beat Gangwon thanks to a late winner. Finally Jeju United were held at home by Gwangju, but stay top of the league. 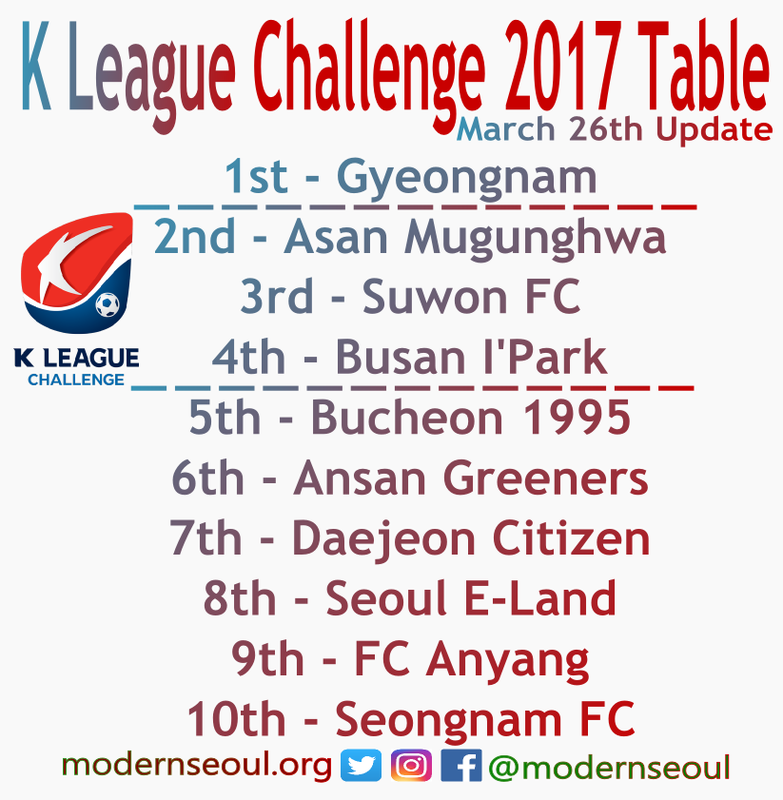 The first game in the Challenge this Sunday Afternoon features two of the league in-form sides Asan and Busan. Asan Mugunghwa have settled into their new city nicely and have won 3 games on the bounce in the league, plus they also won during the week in the cup. Busan I’Park starting strongly winning their opening 2 games, but recently they’ve lost that form. They won in the cup during the week but against K3 League side Gimpo Citizen. Asan should start as slight favorites. Tiredness maybe the factor for both on Sunday. The second and final game of the weekend comes from the Suwon Civil Stadium home of Suwon FC. Suwon lost in the league last weekend to an impressive Asan and then dropped out of the cup against Seongnam. Before those defeats they’d won twice. Top of the table Gyeongnam have 10 points from their opening 4 games, and maybe the most organized defense in the league so far this season. At the moment Suwon aren’t quite working, whilst Gyeongnam look like the team to beat. Therefore we’re going with the risk but league leaders Gyeongnam. Busan claimed an impressive victory over Asan on the road to move them up into 2nd place. Suwon and Gyeongnam either take home a point in the other game, they’re both also in the early title picture.